Starter - Call yourself a Geographer? How much do you know about the progress that the World has made in meeting the Millennium Development Goals (MDG's) ? Click on the blue tab beneath to test your knowledge. Task 1 - Using the Guardian summary sheet (below) of the progress in meeting Goal 1 - Eradicate Extreme Poverty & Hunger, complete the fact finding mission worksheet. 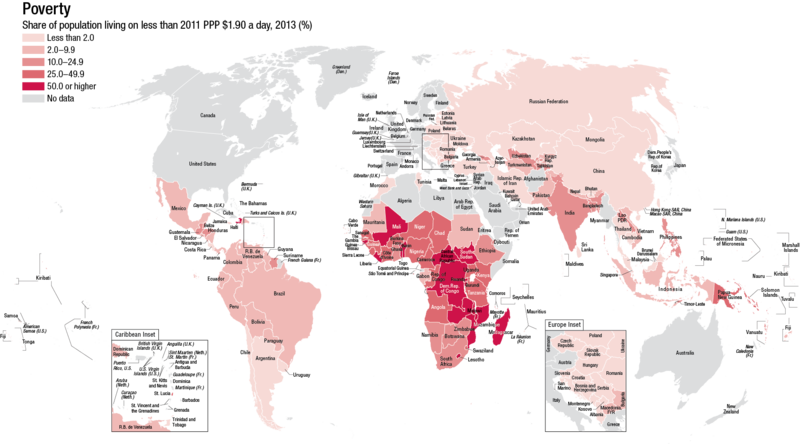 Task 2 - Using a copy of the map above, comment on the regional and continental progress in achieving poverty reduction in light of MDG 1 - Eradicate Extreme Poverty & Hunger. Task 3 - Getting the overall picture of human development and resource use. Click on the yellow tab below to be taken on a journey of 24 slides that charts the history of human development and how global inequality developed quickly after the industrial revolution. The pattern of increasing wealth spreading globally through increasing economic development and a fall in the number of people living in absolute poverty conversely causes an increase in the numbers of middle class people globally. If you rewind back to 1965, the total number of middle class people numbered around 732 MILLION out of a total population of 3.3 billion people. 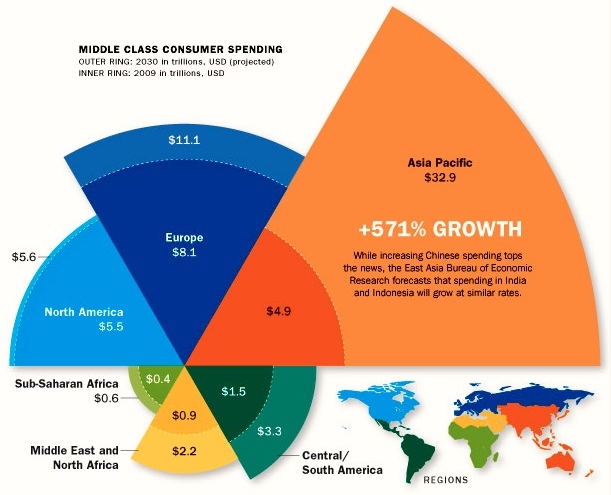 The estimates for 2030 are that middle class people will number 4.9 BILLION out of a total population of 8 billion! The increasing numbers of people in the middle classes is important economically as they demand consumer goods such as electronics, cars, increasing varieties of clothing, mobile phones and associated technologies such as app development and high speed 4G internet connection. They also demand more varied food stuffs and generally a rise in consumption of more "luxurious" food products such as beef as well as imported foods and beverages. Of course, these developments come at huge benefit to TNC's but are potentially disastrous for the environment - think of additional land required for rearing cattle, increased energy demand and the process of e-waste disposal. Task 1 - Check out the infographic story below by clicking on the yellow tab (may be best to open in Edge or Firefox). 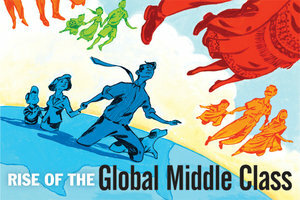 This tracks the rise of the middle class from 1965 until 2030 projected. Pay careful attention to the situation in China & India. Using the pause facility, complete the worksheet below. Task 2 - Watch the two videos beneath and design your own mind map / piktochart that shows the causes and consequences of an explosion of the numbers of people in the middle classes. Try to incorporate the images below into your work too. Take the Footprint calculator test to work out your individual impact on the planet. Where you have the option to 'add more detail', please do so. Take a note of your score as well as a screen shot of your further details and your overshoot day. How did you do? What features caused your footprint to be bigger or smaller than your peers in the class? Who reaches the overshoot threshold the quickest?? 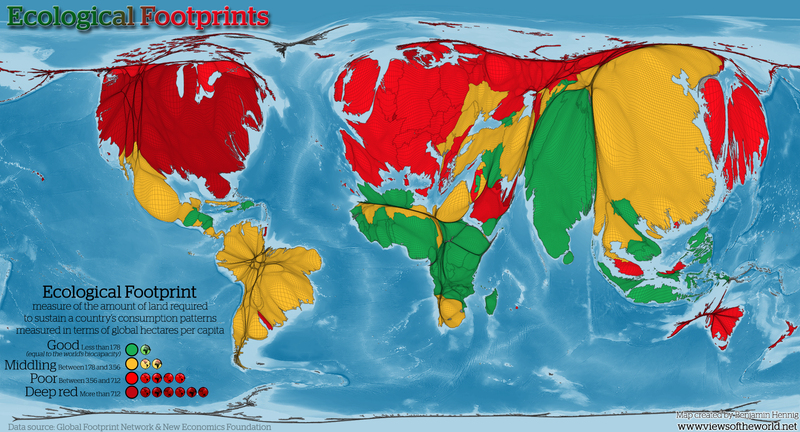 Task 2 - Take a copy of the map to the right hand side (click to enlarge) and write a commentary describing the global disparities in ecological footprint values. Are there any surprises? Task 3 - Complete this quiz sheet. Match each of the following nations to their data sets. China, Niger, Brazil, USA, Australia. 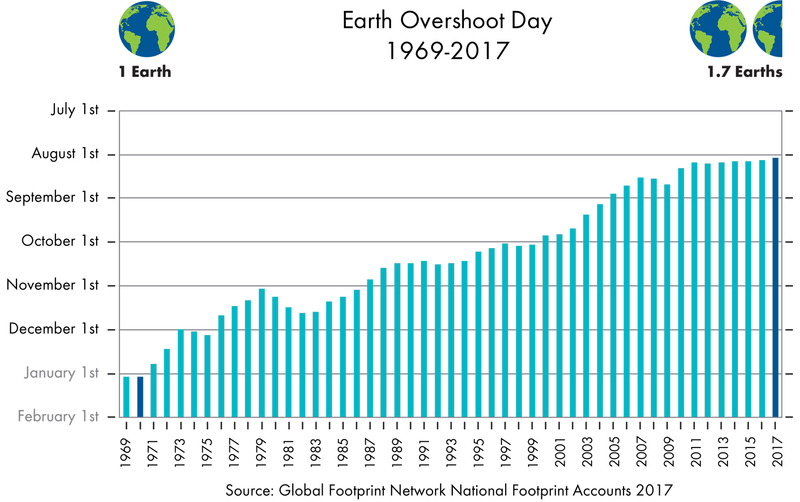 To what extent is a future global increase in ecological footprint inevitable due to a rapid growth of the Middle Class? Tip: Try to use all six of the key terms covered in Task 1 at some point during your answer. Additional Research: Take a closer look at this Esri Story Map that shows attempts in different parts of the world to address high ecological footprints. Take notes on two different places and the schemes that they have in place to reduce their ecological footprint. Starter: Spend five minutes watching the video above. This will introduce you to this new piece of work. Complete the key data worksheet above by filling in the relevant information next to each piece of important data. Traditionally, you may have learnt about water shortages, physical and economic water scarcity and simple schemes to save water. However, some of the content in this piece of work is very new and includes virtual water footprints too. Task 1 - Using the worksheet, describe the differences in water use between HICs and L/MICs in the figure above from UNESCO. Try to explain these differences by thinking about levels of development and economic activity. Task 2 - Click on the orange tab to access a brief summary report from UNESCO on the causes of water shortage and the likely future impacts. i. On the worksheet, take notes on the four main sources that create demand, namely agriculture, production of energy, industrial uses and human consumption. Again, think back to previous work on rise of middle class population and continuing progress in global development (MDG's - SDG's). ii. Take notes on the likely impacts of climate change on future water supplies and vulnerable populations. Task 3 - Study the virtual water footprint map below. ​Coupling this with the water footprint enables us to map out the dependencies and to identify when and where risks may lie, in terms of scarcity and pollution. This has implications for food security, economy and diplomacy. Grey = water required to clean up pollution. Using the worksheet, describe and explain the flow between Brazil and the EU as well as the flow between Pakistan and Brazil. ​The work on changing patterns and trends in land has been primarily covered in the Climate Change section of work here. We will now focus on the issues of changing diets. 5 Minute Reading Task - Get a summary of the issues by reading this Guardian Article. Starter: On the worksheet above, please complete the starter activity and 'thought shower' the main reasons that people choose convenience and fast food diets that may be rich in saturated fats and hidden sugars. Task 1 - Watch the first video that is based on a presentation on a world famous photography project by Peter Menzel that documented the weekly eating habits of different families around the world. ii. The problems caused by intake of too many calories (obesity) in the USA. v. What the 80% rule means in Japan. There have been major changes in diets moving away from traditional home grown and seasonal produce to a more varied diet containing dairy products, meat and of course fast food. This transition has come about with rapid urbanisation, more people working for longer hours, competitive pricing and aggressive marketing campaigns by TNC's in LICs and MICs. Extension Activity - Watch the second video above and make notes on the link between changing meat rich diets and climate change. Task 2 - Watch the video below from the New York Times that highlights the issues caused by such a change in diet in Brazil; a middle income country in South America. Take notes on key content and changing trends. Task 3 - Spend a further 15 minutes skim reading through the full article from the New York times and taking further notes on these trends. Key Extract from the New York Times article - Lots of synthesis in these few sentences that link together large parts of this IB DP course. The story is as much about economics as it is nutrition. As multinational companies push deeper into the developing world, they are transforming local agriculture, spurring farmers to abandon subsistence crops in favor of cash commodities like sugar cane, corn and soybeans — the building blocks for many industrial food products. In places as distant as China, South Africa and Colombia, the rising clout of big food companies also translates into political influence, targetting public health officials seeking soda taxes or legislation aimed at curbing the health impacts of processed food. i. How Much Oil Is Left on Earth? - Where does our oil come from now? ii. Oil Production Has Peaked - How have the patterns and trends of global oil consumption changed in recent years? "The better you do the job of exploiting oil and gas, the sooner that it is gone"
Task 2 - 2017 Update - Watch the last video on the recent Trump ordered shrinking of two National Parks possibly with the view to drill for oil in these once protected areas. Task 3 - Study the two inflated/deflated maps below. Which one is which? Use evidence from the maps and your own knowledge and understanding to explain the differences making reference to specific regions and distortion shapes. a. Click here to be taken to a Wikipedia list of top oil producing nations. Alter the list by clicking on the sort arrow for 'Production bbl/day. Make a notes of the top 5 countries in terms of their production and the value for each. Is there a pattern in terms of geographic location? b. On the same page, alter the 'Consumption bbl/day' tab so that it shows the biggest consumers. Make a note of the top 5 consuming countries. Are there any patterns that can be linked to population and development? Are there major disparities between the consumers and what they produce? Task 5 - Click here to be taken to a short outline description of the advantages and disadvantages of fossil fuels. Create a mind map or two separate spider diagrams to show both. Group Task: You are going to be splitting into pairs to complete a fact finding mission about three alternative sources of energy. You will evaluate their potential to replace the traditional fossil fuel approach to energy generation in countries of all levels of economic development. Presentation will be in front of the rest of the group. Three case study energy sources will be Nuclear, Wind and Solar Power. ii. Details of how this form of energy can be harnessed (the production and mechanisms). Add images. vi. Evaluation of suitability for future mass use. Task 2- Examine the changing importance of three energy alternatives to oil [10 Marks]. Your teacher will write the introduction to this piece of work (see below) and you will be responsible for reading the presentations given by your peers and then formulate your middle section and conclusion (as per the IB essay planner). 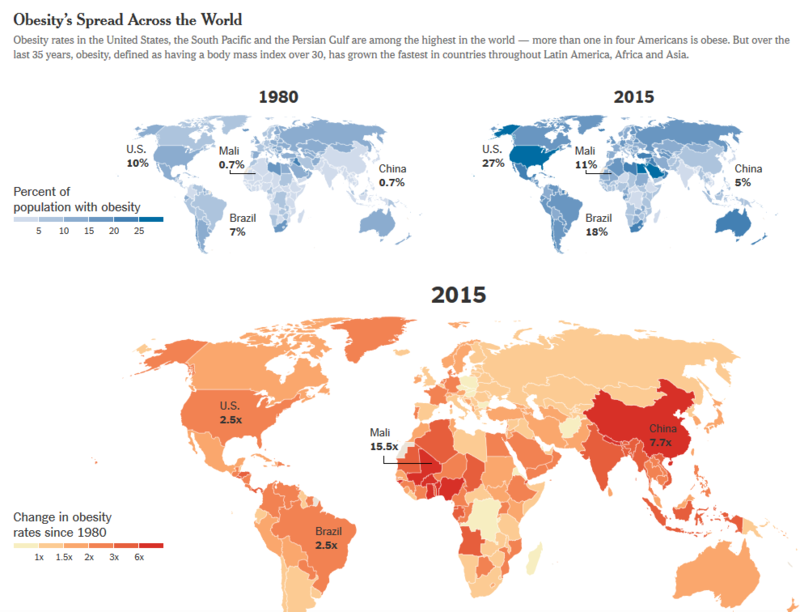 In 2019, oil continues to fuel the modern world. No other substance on earth can equal the enormous impact which the use of oil has had on so many people, so rapidly, in so many ways, and in so many places around the world. Oil in its various refined forms, such as petrol, kerosene, and diesel, has a unique combination of many desirable and useful characteristics including current availability in (decreasing) abundance, ease of transportation and storage and great versatility in end use. Oil is also useful as more than an energy source. It is the basis for the manufacture of petrochemical products including plastics, medicines, paints, and a huge number of other useful materials. Alternative energy sources must be compared with oil in all these various attributes when their substitution for oil is considered. To the untrained geographer, none appears to completely equal oil. This essay will explore the extent to which nuclear, wind and solar power could be considered as a long term replacement for oil and their changing importance in countries at different levels of development.